If these default groups do not meet your requirements, for example, if you've created a custom role and want to grant users the permissions specified by that role, you can create new groups and assign roles and permissions to them. To complete the steps in this guide you must have global administrator access to the Azure portal and Owner access to the UKCloud Azure Stack portal. 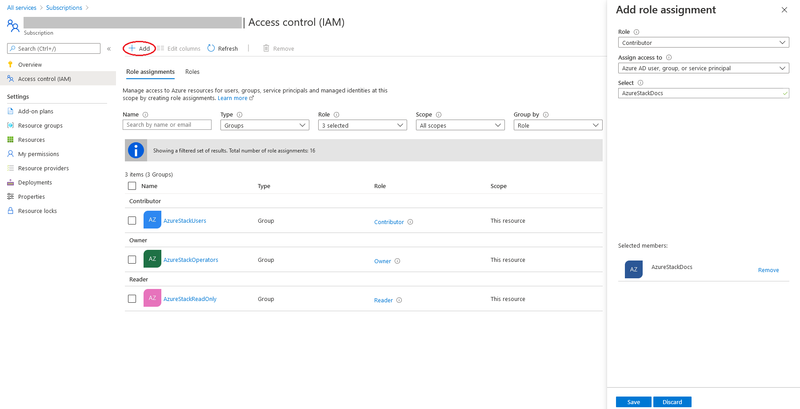 Rather than granting permissions to individual users, we recommend that you first create a group and add your Azure users to that group. Log in to the public Azure portal as a global administrator. Navigate to the Azure Active Directory. You can find the Azure Active Directory by selecting All services and scrolling down to the Security + Identity section. Select Groups and then All groups. Click the New group option. From the Group type list, select Security. 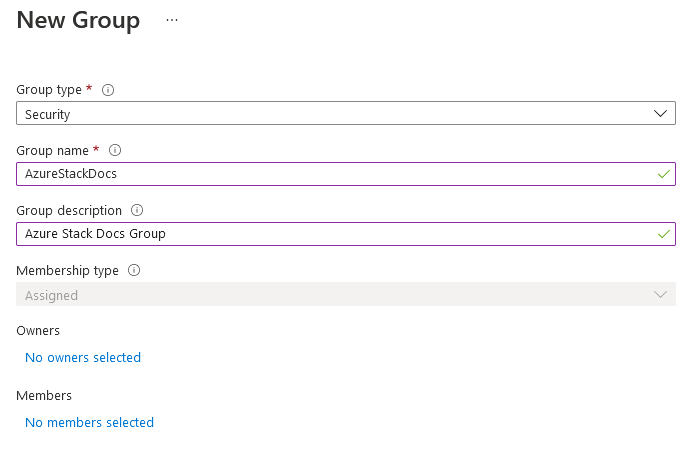 In the Group name field, enter a name for the group, for example, AzureStackGroup. In the Group description field, enter a brief, but meaningful description for the group. From the Membership type list, select Assigned. To add users to the group, open the group, select Members then click Add members. After setting up the user group in Azure, you need to go to the UKCloud Azure Stack portal to grant the appropriate permissions to the group. Log in to the UKCloud Azure Stack portal. If you can't see Subscriptions in your favourites panel, click More services and then Subscriptions. You can add Subscriptions to your favourites panel by clicking the star icon. Select your subscription for UKCloud for Microsoft Azure. From the Role list, select the appropriate role that you want to assign to the group. In the Select field, enter the name of the group you created in Creating a group for UKCloud for Microsoft Azure users.